Get ready for 2014 baseball! Mark your calendar! Opening Day is on Saturday, March 31st. We will kick it off with a parade and our traditional opening day ceremony. Plan to be at the field by 8:30am that morning. 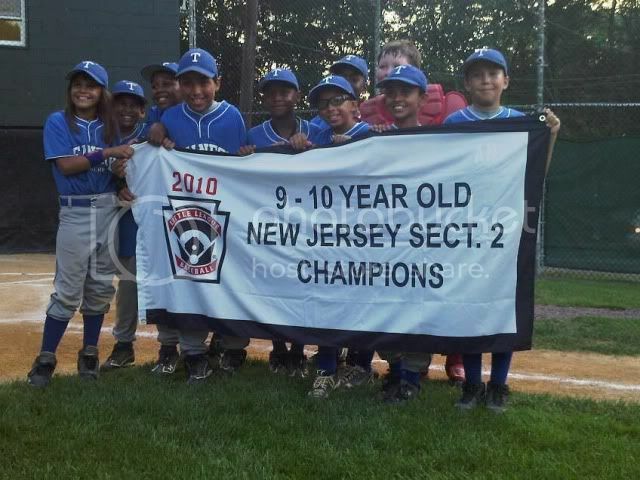 It was another great summer for Teaneck Southern! Our league was again represented at the Little League District 6 Tournament where, after taking 2nd place last year, both our 9/10-year-old softball girls and our 9/10-year-old baseball boys won their respective District 6 Championships—plus our amazing 11/12-year-old baseball boys, last year’s Champs, went on to repeat and become 2013 District 6 Champions once again! [Read More...]. 1964 Teaneck Drugs team. Players are David Bruno, Robbie Roller, Kenny Blumstein, Charlie Rittenger, Dan Lubin, David Glickhouse, Steven Austin, Stevie Weinstock, & Tommy Dal Malle. Coached by Art Dal Malle & Mr. Iconnetti. Wool uniforms that had to be hand back in after the season was over to be used again the following season. Seth Bendian, the same guy who ran our Winter Clinics and T-Ball and Rookie Clinics, is back at our fields this summer with the Seth Bendian Baseball Camp. As you remember Seth not only teaches the game, but makes sure the players have fun while learning. The players will receive instruction in the morning and play games in the afternoon. This is great way to keep your child playing and improving this summer. There have been many Teaneck Southern players over the years who have enjoyed attending Seth's camp. Seth is offering discounts for Teaneck Southern families. Don't be left out and sign your player up today. 15% OFF for TSBL Players!!! MAJOR LEAGUE HOME RUNS- OUTTA THE PARK! For general questions please email us at teanecksouthern@gmail.com. Our 9/10 District team has placed 1st in Section 2! Any and all able-bodied adults and / or high school kids looking for community service hours, are encouraged to help prepare the fields after a soaking rain. The same few people need help so YOUR children can play. Don't wait for an invitation. We'll be at the field early on weekend mornings after a rainfall and week nights when we've had rain as well.